From one of the oldest and most important Swiss Watch makers comes this 300m rated Diver – the Diver 300 AL-525LB4V36 Automatic in Stainless Steel with a rubber strap. 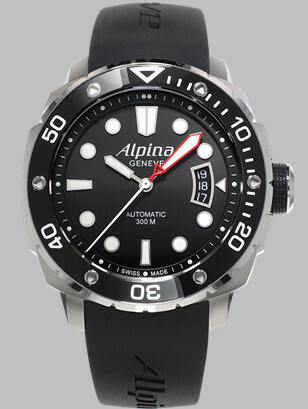 From an Association founded by Gottlieb Hauser called the Alpina Swiss Watchmakers Association or the “Alpinists” their aim being to develop and optimize the manufacture of movements and timepieces and the control of suppliers, Alpina came fully into being in 1901 with the trademark Alpina. High end calibres and watches really came out of Switzerland from then on as a force to be reckoned with. In modern times Alpina made a comeback in around 2002 and have since produced some wonderful in-house complication models, such as the AL-980 Tourbillon, the AL-718 World Timer with all 24 time zones displayed in dial, the AL-950 Automatic Regulator and so forth, brought Alpina back to prominence. Now located in Geneva once again in 2013 they celebrated their 130th Anniversary. I particularly like the Diver models, though in fairness there are a lot of their models I like, such is the quality of manufacture and design from this old Brand. 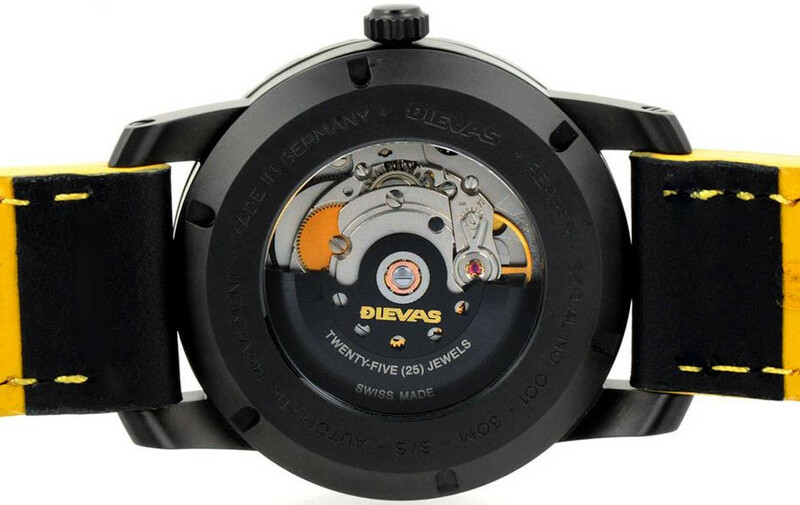 The first image shows the Diver 300 Automatic AL-525LB4V36 from the Seastrong collection, with the L-525 26 jewel movement cased in Stainless Steel, screw down crown and 22mm rubber strap. The Date window @ 3 is the moving date wheel style which I’ve always liked, as even if a hand covers the Date at least part of the wheel is still showing and certainly enough to tell the actual day’s date. Dimensions are 44mm diameter and 13mm depth, unidirectional bezel with clear markings and all numerals, markers and indexes are luminous coated. 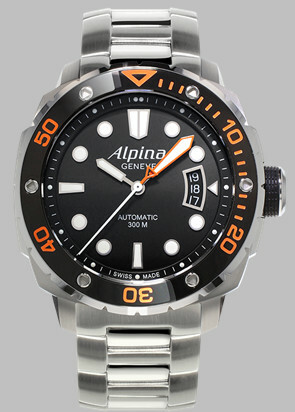 Alpina AL-525LB04V26B with bracelet and colored index. The same watch with alternative strap/bracelet is the AL-525LBV26B with similar specifications of course and both for me are exemplary in the clarity stakes with the matte dial background and large clear indicators – such a pleasure to see. Of course they make quite a large range of models and a visit to their site is well worth the effort and I’m sure there will be the odd model to tempt you, certainly if you want quality and excellent design. After all Alpina have been doing this for a long, long time. Check out their web site for the full range of very excellent models and if you don’t know the name – well you should. I know they’re always on my watch list and whilst at present I have a couple of vintage Alpina models, 2015 might be the year to get a modern one too . . . . Friend of mine asked if I knew of any watch models that had color – bright color, but he was on a budget (getting a small gift for his boy at Christmas) and his lad just loves color. I think it runs in the family and being kind I always thought that the entire family had a color sense issues, especially as the last time I met Charles (no not the Prince!) he was wearing a rather grand red velvet jacket and a green, yes green bow tie. Elegant was probably not the word that sprung to my mind especially when I noted (as if one could not) he was also wearing tan trousers and brown shoes! Anyway I digress – his son obviously takes after his Dad and I thought this watch might do the trick – and it’s rather military-ish style might appeal. 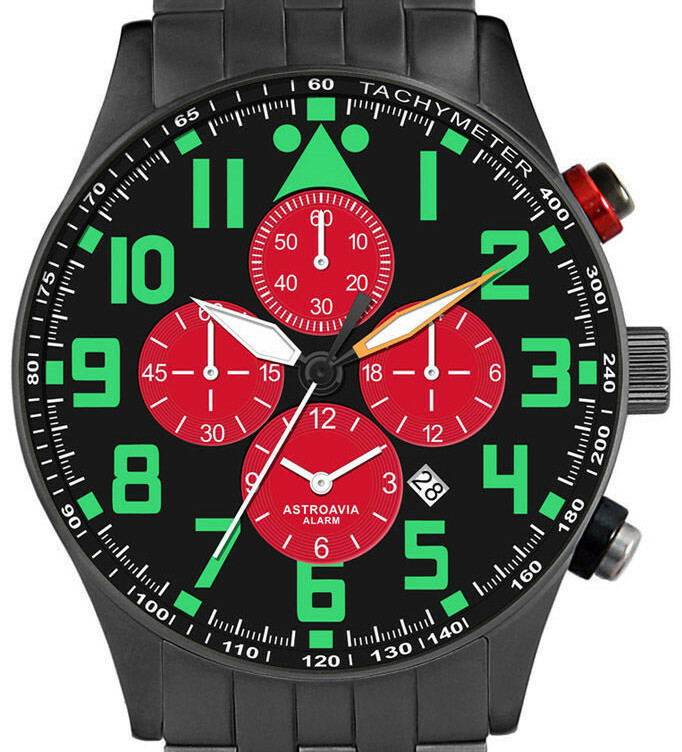 This is the AstroAvia V9S Alarm Chronograph and I’ve just thought it would be an excellent match to my friends attire! But mum’s the word! Anyway it’s a pretty stylish military style model with a YN 64 Quartz Japan movement, so will keep pretty decent time. 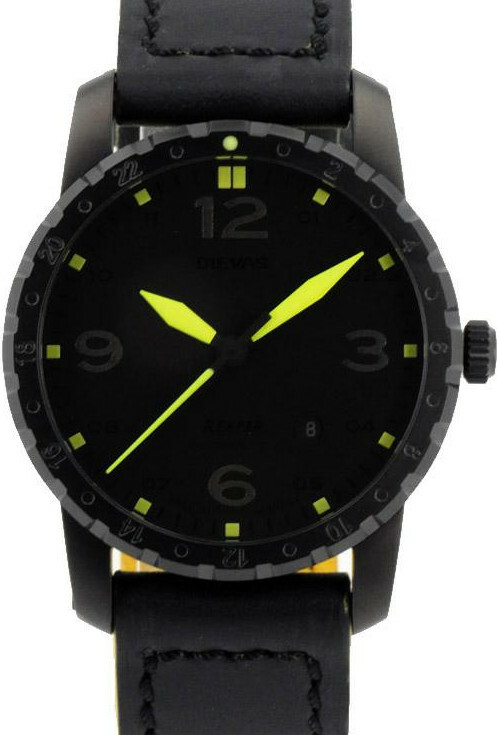 Matte stainless steel case with Black PVD plating and screw back rated 3 ATM, is 43mm diameter by just 11mm depth, so OK for the boy – he’s 14 years old and already going on 6 feet and gangly. 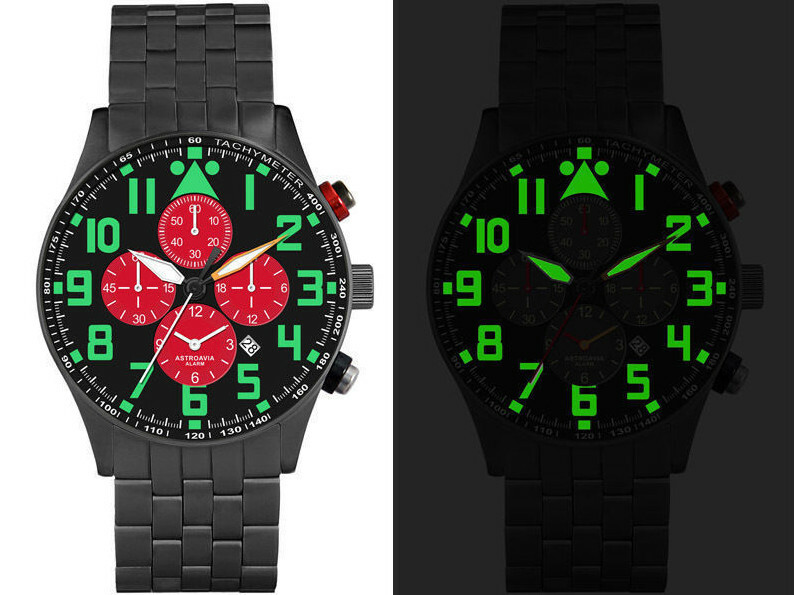 An Alarm function and Chronograph (60 minute timer, 1/5th secs and split times) plus a second Time Zone feature, 24 hour dial, Mineral crystal, black background dial with red sub dials, very green numerals and a white center sweep seconds had – plus a Date window between 4 & 5. It also features a killer red ringed top push button to start the chronograph which seems just right to me and a Tachymeter scale round the perimeter – in fact the more I look at this the more I like it myself! Great stainless Steel band is 22mm so looks in proportion has butterfly buckle and twin pushers. 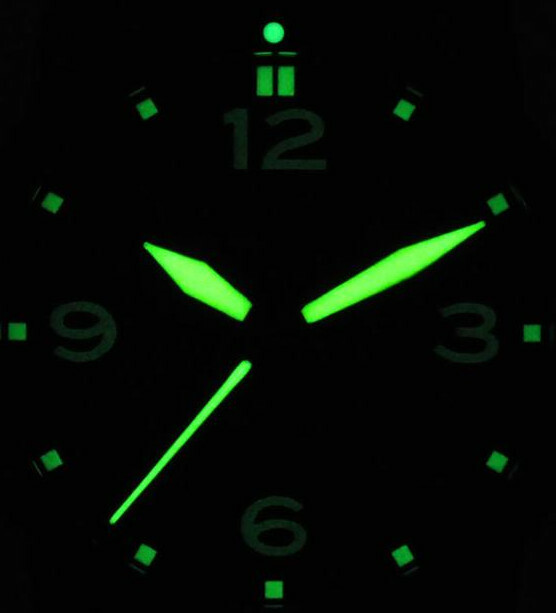 I forgot to mention the hands and dial numerals by the way are coated in Luminova – not Superluminova which is a pity as SuperL is definitely better – and I’ve always been slightly disappointed in Astro’s night look, but hey! maybe they’ve improved. The image supplied by AstroAvia is brilliant – as they tend to be, but how it performs after an hour in the dark – your guess is as good as mine. I’ve seen it for around £140-£170 here in the UK which is within his budget it comes with a 2 year Guarantee and I have a feeling his boy will love this – I know I’m quite taken by it . . . . I did consider another colorful model this time from Swatch and whilst I have a lot of time for this Brand, it was back to the plastic cased fashion style watch, though in fairness close up it’s quite a substantial piece of kit, especially the substantial hour and minute hands and the dial markers. But on balance I didn’t think it would really appeal to this adult yearning lad – the military style steel cased model being more up his street. 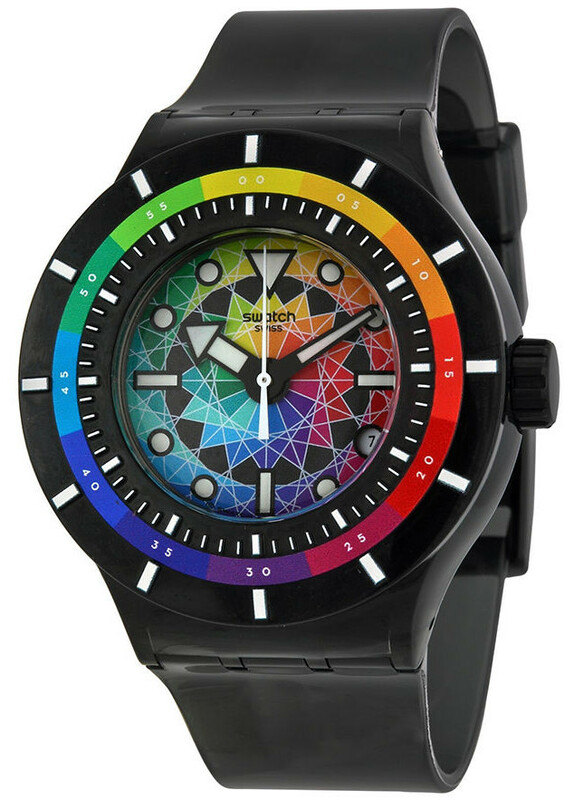 But it’s certainly colorful – this is the Swatch “Chromatic Water” series Multi-color Black Dial unisex model SUUB401 at 42mm diameter x 15mm depth and 20m Water Resistance with Silicon Rubber strap and buckle. Cheaper at around $66 in USA, so perhaps near the £100 once in the UK – and there probably wasn’t time to get it anyway for Christmas. However in the event whilst it’s certainly a “color” contender, in this instance it’s no contest as the AstroAvia definitely has the “look” and is a very adult watch. It manages to get away with the color scheme too, as it just seems to work! Out of all the Braun watches this for me is probably my favorite choice, simply because I can easily see the time and the proportions are right. 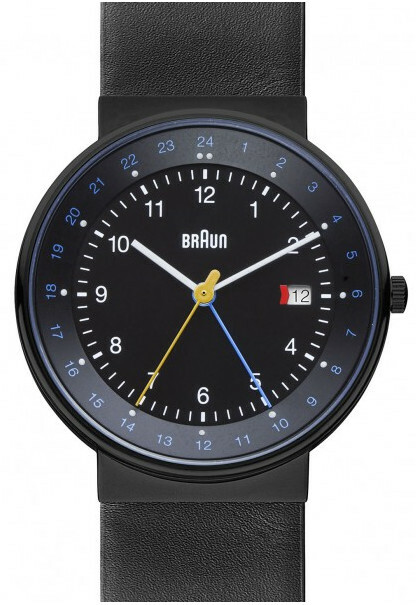 This is the Braun BN0142BKBKG – in black. It’s a neat size at 40mm diameter and only 9mm deep, black matte dial with White Hour and Minute hands, yellow center seconds hand and a nice light Blue contrasting 24hr/GMT pointer. A white against black Date window @3 with a tiny Red marker at the edge. The outer 24hr index is printed blue to match the pointer and the only other feature is the Braun logo in white. All in all this model has great clarity and that’s a big plus in my book. It features a Swiss GMT/dual time Ronda movement and the case is non glossy black coated Stainless Steel with a black leather strap. Price wise this can be sourced for perhaps around £120. My second choice is the Braun BN0159BKBKG which features an Ana/Digi dial with a neat digital function set – Dual Time, Day, Date, Alarm, Chronograph and an EL back-light. 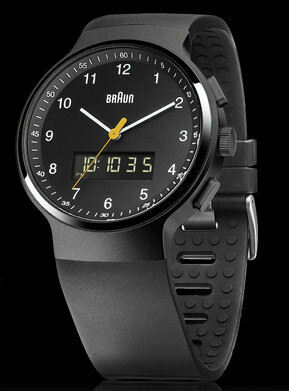 A PU black rubber strap made specifically for comfort according to Braun so should be good. Like most Chronographs there are two pushers on the right side of the case and a well figured Crown. 44mm wide by 10mm deep this is slightly larger and again can be sourced for no more than £150 mark. Could be a Japanese movement this time as I couldn’t find the specification listed, but that’s often the case and I would assume it’s of good quality from Braun, so no worries there. I like the fact they use the ana/digi style here for the chronograph as I’ve found before with Braun when they add analogue sub-dials, the overall dial can become a bit cluttered for me – the digital display neatly avoids that and is much neater as a result. So if you like the Braun style then either one of these could be a worthwhile choice as a gift. They both have that “today” appearance which is no mean feat when considering the first model drew it’s inspiration from the iconic Braun AW24 of the 1980s. I would comment that the two featured here are very much Classics in their own right and cleverly manage with that distinct Braun look to outdo many of the so called “modern” watches, which by their very blandness tend to court obscurity. I also like the fact that should you (Heaven forbid) have a problem with any Braun model there is a UK phone and address for servicing & Guarantee work. Designer stuff has never been a top priority with me and especially in the world of watches, yet today there are more fashion Brands around than ever. Once their timepiece offerings were poor quality cheap Asian imports, but today you can find pretty decent watch models that can compete with some of the more traditional Brands. 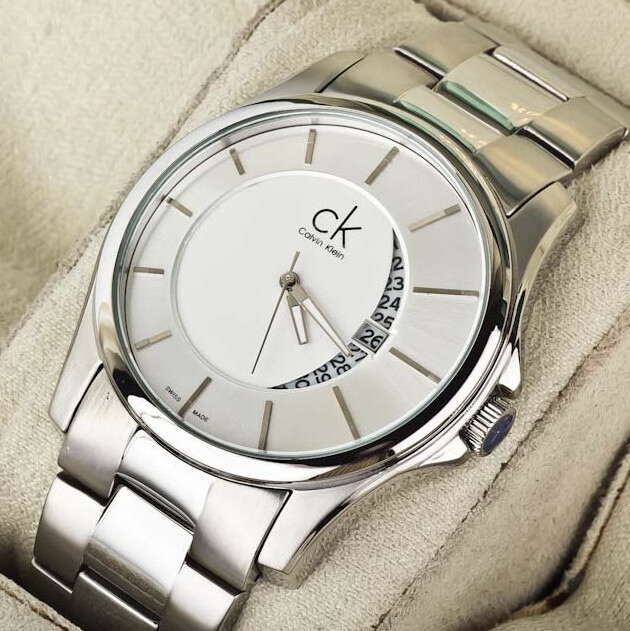 CK or Calvin Klein, the Fashion House which started way back in 1968, launched their Watches line in 1997 and each year bring out a new range to tempt the fashion conscious amongst us. I’ve picked three that look good to me, though apologies in advance as I’ve seen these only from a distance, so little or no details and it really surprised me to find that many of the latest CK models are in fact very difficult to find, certainly in retail outlets. 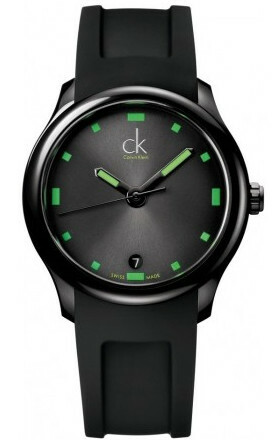 CK design at it’s best – love the date wheel aperture. Movement wise they all feature Quartz, but no detail as most of the customer base are more interested, I’m guessing, in the “look” rather than technicalities. And these particular models certainly “look” good to me and show off the “designer” aspects of the Company. The only model I have price details on and model number is the last one – the Green “Visible” watch which has a retail of around £250, though I have seen it for less. What each of these models has however is “style” apparently 2014 designs and certainly shows that design is definitely not dead. Unfortunately the prevalence of “G” this and “Tough” that has sort of blindsided us away from the fact that we don’t all want outdoor, military, rugged watches when we’re out to dinner, or taking in a show. Sometimes we want a bit of “bling” – without being too ostentatious of course – and perhaps a more subtle and elegant hint of design to go with that new suit and one that actually manages to fit under a shirt cuff. However as I said, these are not that easy to find, especially the first two featured and to me this is extraordinary, especially on the run up to Christmas – which is THE time for giving gifts and if you can’t show off at least a bit of “flash” at the party, when can you! Anyway for what it’s worth, I feature them here as some more ideas for you at this festive time – if you can find ’em! I’ve always like the look of the entire Dievas range of watches, but this model – the Dievas Reaper – well it says it all for me! The Dievas Reaper – nothing else like it. 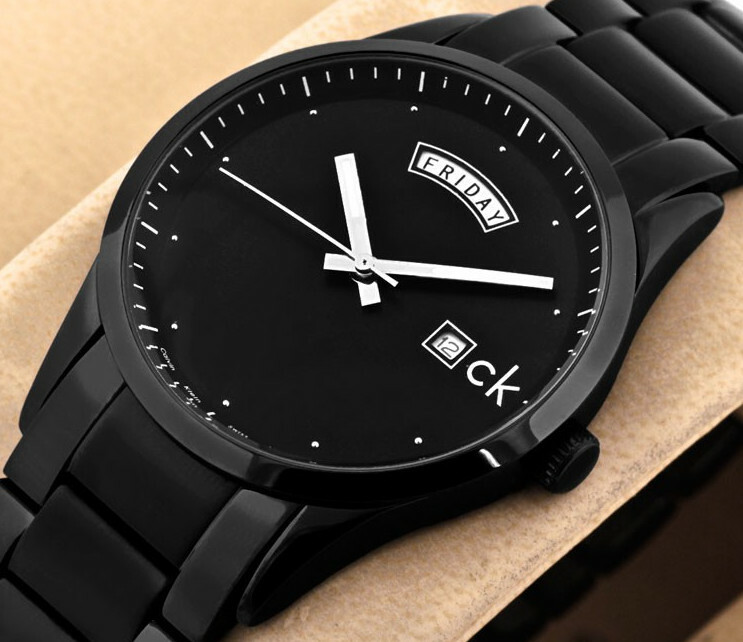 For looks it is outstanding and definitely will appeal to the macho in all of us and OK it’s black case, black dial, black numerals – in fact pretty much black everything and yet – Wow! look at the important part – the hour, minute, seconds hand and markers – no question of lack of clarity here and as I say – outstanding. Great components too with Sapphire Crystal, a Swiss Automatic ETA 2824-2 housed in a premium 316L CNC watch case, which has 30µm layered hardening of the case to 1300 Hv on the Vickers scale(6 times the original hardness of normal stainless steel) – so it don’t scratch too easy! The bezel is uni-directional, the case is 50m Water Resistant and just 43mm diameter. Let’s face it – it makes most Shocks look prissy! In daytime great – at night even better! Striking Superluminova hands are something special in that incredible bright yellow – the contrast is amazing day and night. A good leather strap and steel buckle complete the picture if you can drag your eyes away from those hands! IF you can get one, then this is a great gift and will undoubtedly elicit a Wow! from the receiver. Now OK it’s been around for a while and was a limited edition, but IF you see one and it’s in good condition I would not hesitate. I actually did see one recently but too late – it was gone! And whilst it may seem a”mysterious” model it is actually open at the back – well via an exhibition window that is – there you can see the ETA movement ticking away – it’s alive! Seems to me that once you have one of these models you might just see one in an Estate auction, if the relatives missed it that is – because it is a rare specimen these days and if I could get my hands on one – then it’s Christmas for me whatever the time of year! 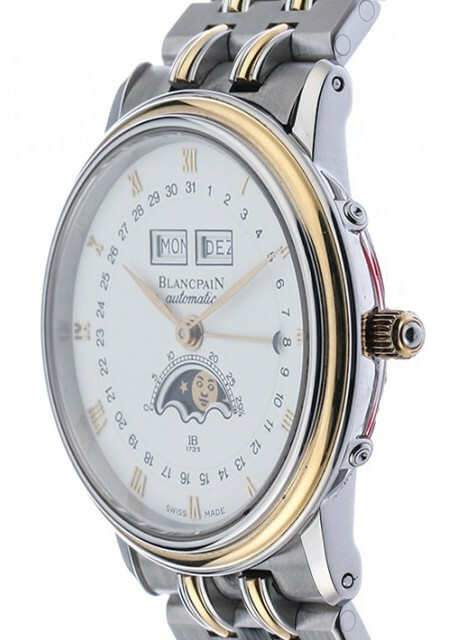 A favorite vintage classic model for Christmas is this Blancpain Stainless Steel, 18k Gold Automatic Calendar & Full Moon Phase model Rf.6595. Automatic winding, Sapphire crystal and just 34mm diameter it’s the perfect dress watch with style and very difficult to beat. In very good condition for a pre-owned watch and at a price of – £2198.00. For me this has to be a gift! I hasten to add that I am not selling this watch – that’s not my business. However it is for sale at one of the European Dealers and can be found on http://www.watch.de/ and was available when I wrote this Post. 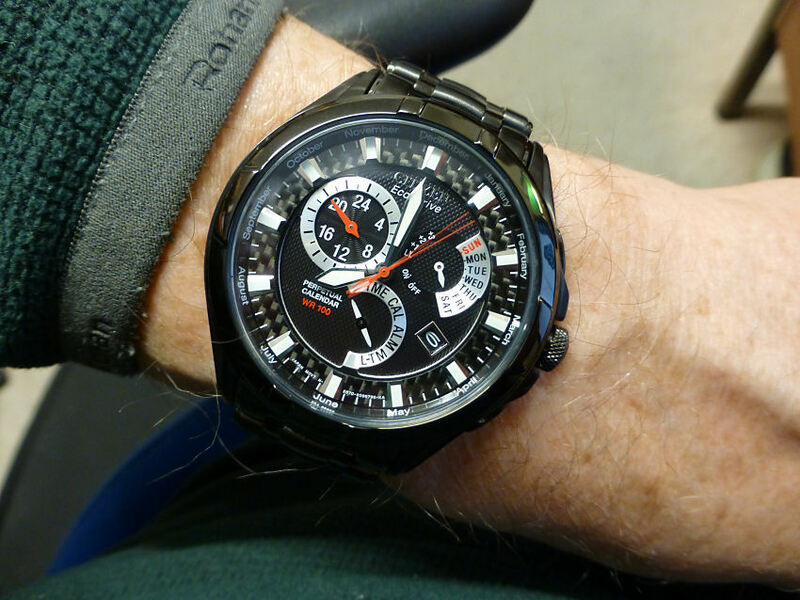 Thought I’d feature a Christmas gift idea of mine – the Citizen BL8097-52E. This is a model that has proved itself to be a bit of a winner – a dark surprise if you will – with most everyone who has either bought it or received it as a gift and that’s a solid recommendation in my book. 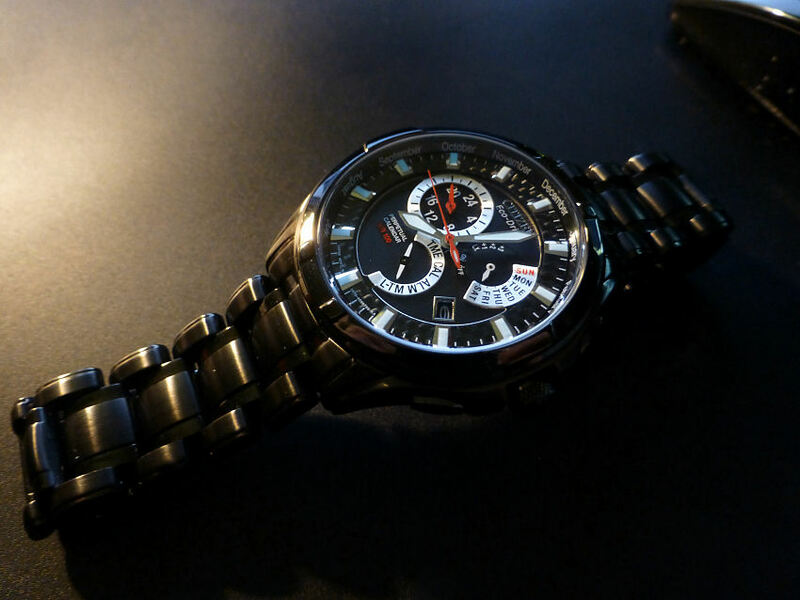 It’s one of those wear and forget models that Citizen occasionally produce owing to modest but useful practical functions and good looks. 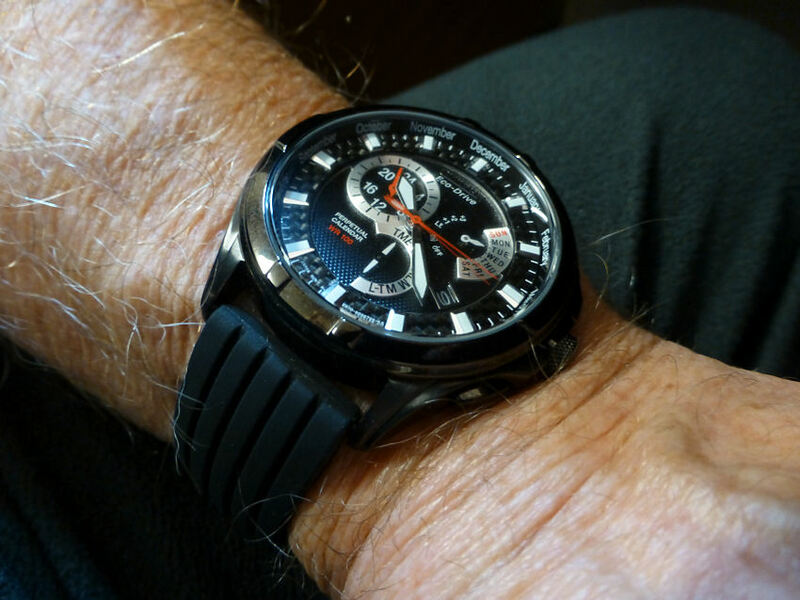 1) it’s Eco-drive which means no battery worries ever – 2) at a glance you can read the Time, Day and the Date – 3) Anti-reflective Mineral Crystal assists with visibility I’m glad to say as the sub-dial & Index dials unfortunately have silver text plates – 4) it has a Perpetual Calendar to 2100 including Leap Years – 5) it has remarkably slim case dimensions 41mm x 12mm with unobtrusive pushers – 6) it is IP treated black/Grey two tone Stainless steel case and bracelet – 7) 100m Water Resistance – 8) it has a 24hr Alarm function and Dual Time indication – 9) it has full broad sword shaped hour and minute hands that are luminous as are the indices – 10) Once charged fully the power reserve is approximately 7 months or 1.5 years with Power Save function. Also as shown in one of my images these luminous aspects are actually very good and very blue. Once the watch is set up, which is not too difficult it more or less functions away without further intervention. Basically the Time (home time I call it) is set by selection of the Time position on the Mode dial. There is also however a Dual Time feature which is set by selecting the Local Time (L-TM) position on the Mode dial. Once in this Mode it can be fast set to change in 1 hour increments, so very useful for travel and different Time Zones. and once set use this for Local Time (destination time I call it). The Months noted around the dial perimeter are used solely during setting the time when you first receive the watch and are not part of the visual Time and Date indication when reading the time. The Day of the week can also be set and altered quickly using Push button B below the crown. Push button A above the crown is used for the Alarm ON/Off control. So basically the “quick glance” at the dial will show you the Time, the Date and the Day of the week. If you don’t know what year it is, then I’d say you have another problem!) ;-). It will also indicate the Alarm state. If the dial is not exposed to light for more than 30 minutes when in Time or Local Time mode, the auto Power Save function is activated. The Second hand moves and stops at the 12 o’clock park position leaving the 24hr, Hour and Minute hands to continue as before and the watch keeps normal time. 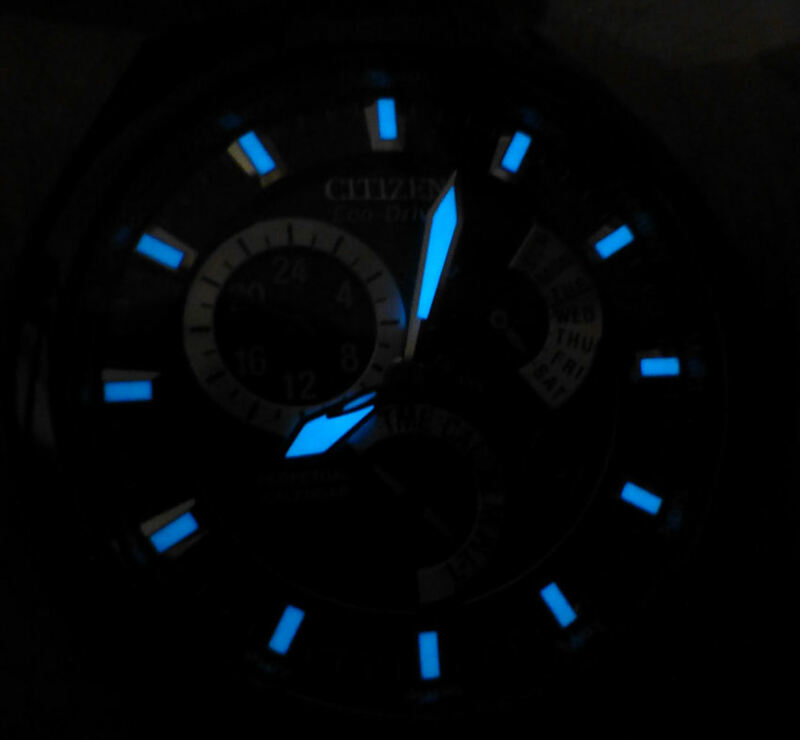 When light falls on the dial again, the Second hand resumes correctly. Settings wise the wearer can set the Year, Month, Day and Date, Leap Year data and Time and this you will sort out when you first get the watch, though if that nice Dealer has set it all for you, so much the better. But always a good idea to fiddle around with it yourself so you know what to do and what the various controls are for. So although this model is relatively modest and dare I say practical in function capability, visually it is perhaps less so. The case is rather striking in black IP treated Stainless steel and quite glossy though the matching bracelet is toned down a fraction having a satin finish apart from the edges which are also gloss. The case dimensions are 45mm diameter including the crown, approx 12mm thick and a neat 46mm lug to lug which will suit those of use with smaller wrists. A pretty solid model this weighing in at 135 gms and that’s with 4 bracelet links removed to fit my average wrist. And regarding bracelet adjustment- this uses split pins but thankfully no tiny collars within the bracelet unlike some Citizens, so is very easy to manage. To remove a link simply push out the pin on the end of it and in the direction of the little arrow on the back surface – the pin will simply drop out. This separates the bracelet in two, then repeat with the pin on the other end of the link, then remove the link. Join the two ends of the bracelet together, slip in the split pin from the other end (the opposite direction) until it gets tight, then tap it in flush – and that’s it. The bracelet fits to standard spring bars, though is a non standard 21mm width. But I’m sure if required a 22mm rubber or leather strap could easily be coaxed a fraction to fit perfectly. The supplied bracelet is in fact VERY comfortable so I wouldn’t change it personally. I’ve currently seen it for just over £300 and for a discounted price of £239 (out of stock) BUT it can be bought for around £180 which I think is a very good price – so maybe a Christmas present for someone and without breaking the bank! I removed the original bracelet and fitted the Silicon strap in around 1 minute. I then cut the Silicon rubber strap to suit my wrist (under 5 minutes with trial and error) – so job done easily in under 10 minutes with little or no skill level required. The advantage of having a watch with standard spring bars strap/bracelet fitting. The only negative for me is the silver color sub-dial and indication index dials which in certain light situations do make it difficult to make out the hands. This is a problem with any of these dials that feature bright backgrounds and especially if they are also reflective. For example, take the Week Days indicator – the right half (with the Days printed) is silvered and yet the left side is not. The right side causes the problem – the left side does not. I rest my case! Such a simple thing and yet totally counter productive in reference to clarity, which is a pity as this is an excellent model otherwise.